Over the years I have had the privilege of owning and using some incredible blades. The range of knives includes purpose driven full tang knives from Dave Beck to Busse Combat and hollow handled sawback knives from Parrish and Crain. Striders and Mad Dog Knives accompanied me in the Sandbox. In fact I still have my trusty Strider BN-SS that had proven itself on many occasions in Iraq. One particular knife that I have been using daily for almost 2 years now, is the Bear Cub Knives “Grizzly”. These knives are meticulously crafted by the Dutch master knife maker, Andrew Jordan. OAL- 8.75 inches with a full tapered tang made from specially treated D2 tool steel. Handle slabs- OD green canvas micarta secured with epoxy and pinned. 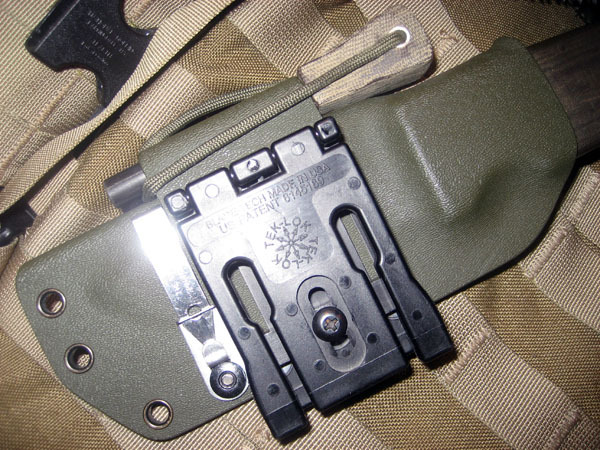 Sheath- OD Green Kydex with Ferro Rod holder with tek-lock. You can also see that I have attached a small pair of tweezers to the back of the sheath. This was done because I have had slivers in the past that had become infected. Tweezers are an indispensable aid and take up no room on the sheath. 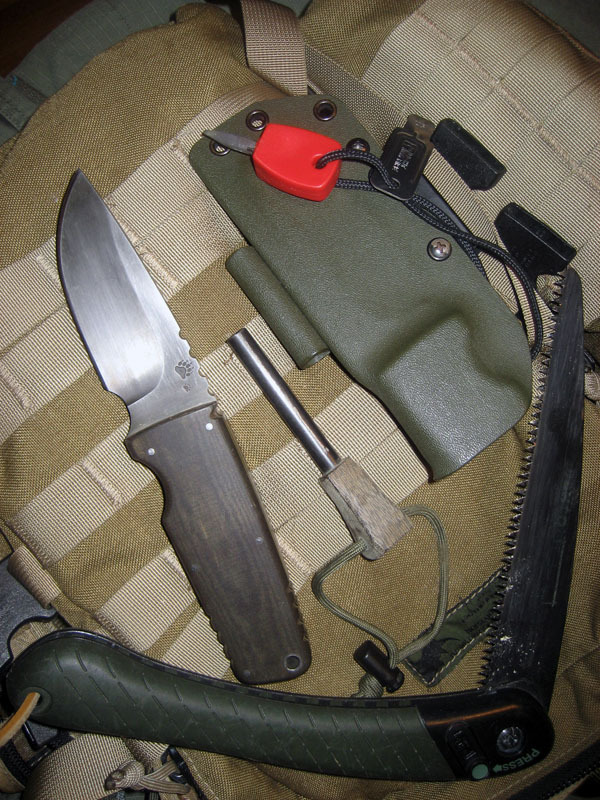 Custom OD Micarta handled Swedish Military Ferro Rod completes the system. Mr. Jordan is very well known in certain circles for making some of the finest forged and stock removal combat/survival knives on the planet earth. 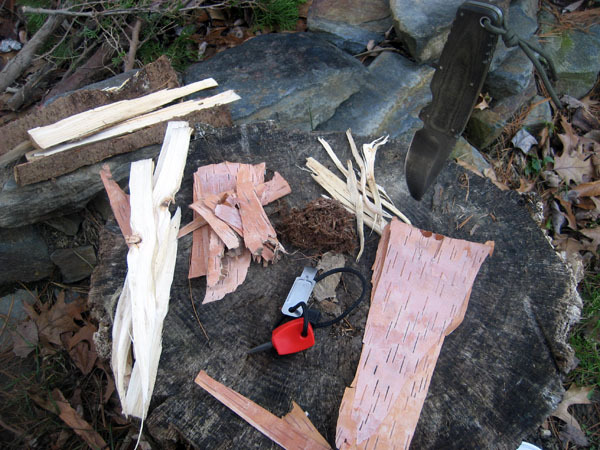 These Bear Cub knives have been in use in certain Survival Schools across Europe for a while now. They have held up with out fail in the arid African Bush to the Sub-Zero temps of Arctic Survival in Finland. Because of its compact size and robust structure, this is a take anywhere and do just about anything knife. 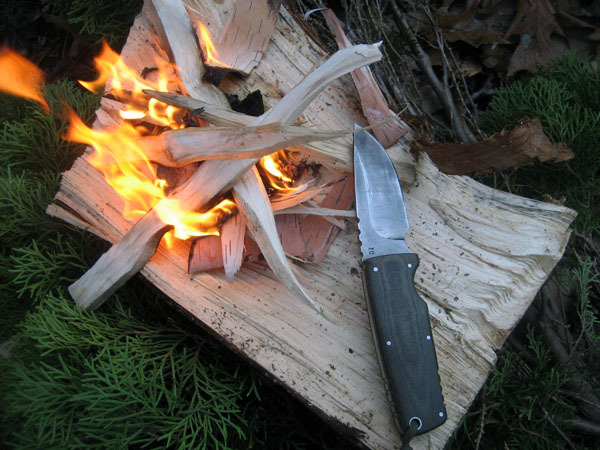 It possesses the all the traits I consider important in a survival knife, with most important; having it when it’s needed. I carry it “tracker style” across the small the back and when not on my belt, it rides unnoticed in my Kifaru E&E pack. 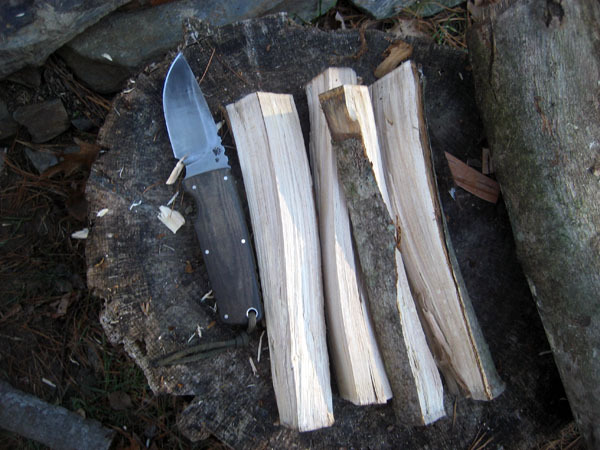 Obviously this is not a big chopper, however via the use of the brain (number 1 survival tool) and a sturdy baton, it will do just about any big knife task. I have felled small trees for shelter poles and it will split medium sized logs without issue(see pics). The thickness of the blade allows prying with out fear the blade failing. It will breech a door or cut a shooting port through a wall if needed. With the combination of being a very robust cutting tool with excellent edge geometry, it can cover a wide range of use for anything I would need for back country or urban environments. Outstanding piece of kit.